CARIBOU — For the fourteenth consecutive year Northern Maine Development Commission has elected not to increase dues to member communities. Meeting Thursday, Aug. 18 in Caribou, the NMDC Executive Board approved the dues structure for 2016-17. The dues formula is based on 50 percent valuation and 50 percent population. The member town with the least population is Glenwood Plantation in Southern Aroostook, with three people. The Unorganized Territories, due to Bancroft deorganizing, will see an increase of $276.60. “Member dues are an important component of NMDC’s resources, member towns/cities control the operations of NMDC and they collectively decide which services and programs NMDC provides to the region,” said Bob Clark NMDC Executive Director. 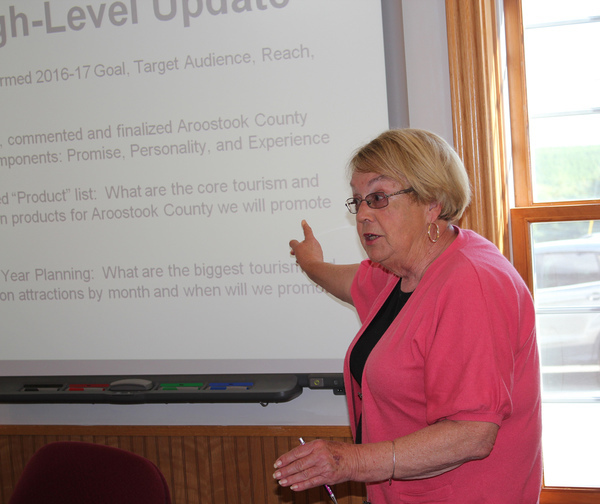 Also at the meeting Patricia Sutherland, chairperson of the Aroostook County Tourism (ACT) board, presented on the group’s marketing plan for the fiscal year. ACT’s core products will advertise and promote soft to medium adventure tourism, winter sports, lake and river fishing and fall colors. Secondary to those products will be cultural opportunities, neighborhood opportunities and two-nation vacation opportunities. “ACT will make its pitch to potential tourists by using nostalgia, sharing adventure stories and building loyalty to the Aroostook County difference,” added Sutherland. ACT, a standing committee of NMDC, is dedicated to improving the economy of northern Maine through its tourism efforts. Working under the brand Aroostook “the Crown of Maine”, ACT promotes some of the region’s greatest assets like its pristine beauty, diverse culture, storied history and wonderful people to potential visitors from around the world. The Executive Board also approved an Economic Adjustment Assistance grant application to the Economic Development Administration in the amount of $221,500 to grow the population of the Aroostook Washington Economic Development District (AWEDD) by developing capacity to assist agricultural entrepreneurs in locating to the region to farm underutilized land, which remains fallow or near fallow due to the long-term decline in commodity crop acreage. Inventory available, tillable land, price per acre average (also compared to national average), and catalog possible land use issues. Develop an AWEDD wide Diversified Agriculture Working Group(s). Perform gap analysis on assistance to potential producers to expand in or locate to Aroostook and Washington counties. Develop consortium of support organizations and establish NMDC as first point of contact for potential producers. Utilize Workforce Center of Excellence model to create AWEDD’s Agricultural Accelerator Center. Identify potential immigrants with agricultural backgrounds or interests. Develop food aggregation component to assist in marketing of current and additional food production, as part of an overall regional production and distribution plan. St. Agatha town manager Gary Picard was voted to the Executive Board to fill an open seat and Eagle Lake town manager Sandra Fournier, who was not reelected to the board at the annual meeting in June, was presented a plaque for her service. A ribbon cutting ceremony was recently held for Aroostook Driving School. Pictured from left are, Theresa Fowler, executive director Central Aroostook Chamber of Commerce; Ryan Deprey and Todd Albert, co-owners Aroostook Driving School LLC; and Josh Nadeau, Small Business Development Center counselor Northern Maine Development Commission. CARIBOU — Two RSU 39 employees, with help from the Northern Maine Development Commission Business Finance Division, have started a side business, Aroostook Driving School LLC, to meet a demand in the region. Caribou has supported two private driving schools since 1993, when driver’s education was removed from the curriculum at Caribou High School. One of the two current providers will be leaving the market due to retirement, which meant an opportunity for Ryan Deprey and Todd Albert. NMDC Small Business Development Center counselor Josh Nadeau said both Deprey and Albert are well known in the community and have a great reputation. The new business also received a loan from NMDC. The Aroostook Driving School will be offering classes throughout the year and both traditional students and adults can register by contacting Deprey at 207-551-6181, or Albert at 207-227-0227. The school can also be reached by email at, aroostookdrivingschool@yahoo.com. For more information about free small business counseling and small business loans, contact Spooner at 493-5766 or Nadeau at 493-5765. A longstanding business in Caribou has a new owner, thanks to assistance from Northern Maine Development Commission. Paul Morgan of Fort Fairfield purchased the existing Dodo’s Market located at 539 Access Highway earlier this month. Dodo’s Market was built in 1965 as a convenience store and has been in operation since then. Dodo’s is located between Caribou and Limestone near the former Loring Air Force Base. This well-established business offers a variety of grocery products as well as snacks, gas, and lottery tickets. Morgan secured financing for the purchase from NMDC. Also in August the BFD closed a loan with an existing client. Caldwells Auto Sales and Service funding will allow Caldwells to purchase completed, ready for sale, vehicles for their Fort Fairfield location. The Caldwell family has owned Caldwell’s Auto, LLC in Limestone for more than twenty years and have experienced great growth. Starting out as a small repair and paint shop, growing to offer parts, vehicle sales, and reconditioning. The new business and location in Fort Fairfield will allow them additional visibility and traffic. EAST MILLINOCKET — Three members of the Aroostook Partnership’s Forest Products Industry Cluster made a pitch for growing the forest economy of the state to the Economic Development Assessment Team (EDAT), which was in northern Maine recently. Partnership President Bob Dorsey; Dana Saucier, a forest products consultant; and Don Tardie, a retired mill manager presented to the EDAT in East Millinocket Thursday, Aug. 18. Responding to a plea from Maine’s congressional delegation, the U.S. Department of Commerce is investigating how to boost the state’s beleaguered forest-products industry and communities that depend on it. The department dispatched the EDAT on a three-day tour of Maine mills, forestry operations and communities suffering because of the recent spate of mill closings. Dorsey said specific recommendations from the Cluster members included, assisting Maine by providing funds to conduct a forest industry (Sector) benchmarking study to highlight where our industry in the state sits relative to other forested states and countries competition wise. Provide funds to hire a forest engineering consulting company to conduct geospatial forest resource inventory analysis to supplement the survey currently being used in the State. And finally, in light of Maine's lack of an existing economic development platform, provide funds to enable an outside consulting company, to perform a thorough objective benchmarking study and analysis of successful States who are excelling in attracting investment capital, businesses to locate in their state and have increased jobs within their state while growing their already embedded companies to remain and grow. More than 30 forest products industry representatives, bankers, educators, economic and workforce development officials and others make up the Northern Forest Products Industry Cluster. The cluster was formed with the goals of increasing value added processing (current and potential), create jobs and grow the forest economy of Aroostook and Maine. The forest products industry represents more than 6,750 jobs in Aroostook County and is the major economic engine of the region. The Aroostook Partnership, a public-private partnership representing more than 100 businesses, Northern Maine Community College, University of Maine at Presque Isle, University of Maine at Fort Kent, Husson University and Northern Maine Development Commission, is dedicated to aggressive and effective results-oriented economic development actions that leverage the financial commitments and talents of the private sector in close partnership with the public sector. This electronic newsletter replaces a printed version, which was distributed by mail for the past four years. Please forward this on to interested parties, municipal officials and others who may wish to be kept apprised of planning and economic development activities of Northern Maine Development Commission. Please feel free to provide comments and suggestions to Jon Gulliver, Director of Investor and Community Relations at jgulliver@nmdc.org.